The foundations are made of six concentric walls. The outer three are of massive construction, as they were meant to support the entire building and they have no openings to circulate within. The three inner ones have openings/doors and form a very interesting labyrinth of three circular corridors directed towards the center of the monument. 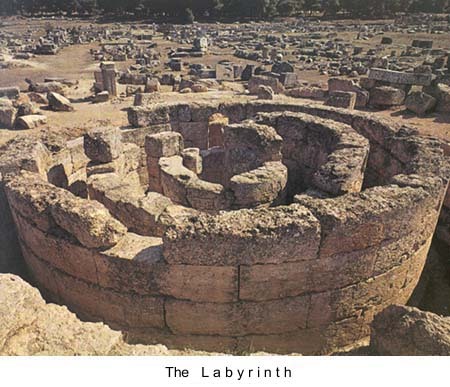 In the labyrinth of the Tholos, consisting of the three inner corridors, the brown yellowish snakes of Asclepius, the so-called "paries" were kept. These snakes were used for healing purposes, licking the wounds of the sick and, according to Pausanias, they belonged to the non dangerous species. They were sent, not only all over Greece to other Sanctuaries of Asclepius, but also to Rome for the same purpose. The species of the “paries” snakes appeared only in Epidaurus. The center of the labyrinth corresponded to the central white stone of the surface. Actually, there was an opening giving access to the central white stone of the floor. The main structure was not supported by the three inner rings.